I had the distinct pleasure of sampling Amella’s Artisan Cocoa Butter Caramels and OMG they are decadent and scrumptious. These caramels have an incredible texture – just a bit chewy and so creamy and buttery that they just melt in your mouth. Passion Fruit: Out of the three flavors I tried, the passion fruit was my least favorite and it was still excellent. 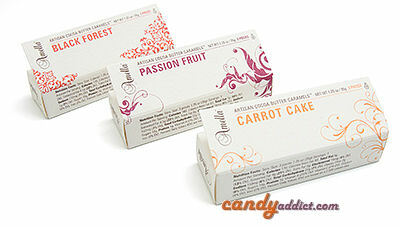 The caramels include real passion fruit, cocoa butter, and Tahitian vanilla and are hand dipped in milk chocolate. The passion fruit flavor is really strong and tangy – if you’re into passion fruit these will make you do the happy dance. Since I think passion fruit is just ok, I’d have preferred more caramel flavor. But even so, yum!